Everett Collection Charlie Sheen in Platoon, 1986. Stars: Charlie Sheen, Tom Berenger, Willem Dafoe. Oliver Stone’s answer to probably every John Wayne war film ever made. Oliver Stone’s Platoon, about a group of American infantrymen in Vietnam between 1967 and 1968, is the first Hollywood film about this country’s Southeast Asian adventure that’s just a war movie—and, weirdly, its straightforward genre-picture intensity makes all the other film treatments of the subject look evasive and superficial. Even leaving aside the recently popular P.O.W.-rescue movies with Sylvester Stallone and Chuck Norris, which are simply macho pulp in exotic settings, Milton Caniff on steroids, American movies haven’t done very well by the horrors of Vietnam and Cambodia. All the serious films about Southeast Asia of the past ten years have been so intent on “coming to terms” with the experience that they’ve barely bothered to represent it. For all the virtues of Apocalypse Now, no one could possibly have learned anything about Vietnam from it. Coppola staged the war as a psychedelic opera—jungles bursting into flames with the Doors’ sinister “The End” on the soundtrack, copters swooping out of the sky to the music of “Ride of the Valkyries”—and the grandiose style robbed the subject of its specificity. Coppola was so caught up in creating his huge metaphoric vision of chaos (derived, in just about equal parts, from Heart of Darkness and Michael Herr’s Dispatches) that he seemed not to notice the inanity of the movie’s subtext: that the war could have been won if our military leaders weren’t so inept and our soldiers so stoned, if only we Americans weren’t so stupid and spiritually empty. Michael Cimino’s Oscar-winner, The Deer Hunter, also featured a hallucinated Vietnam: the war was a bad dream that his heroes, a bunch of regular-guy Pennsylvania factory workers, couldn’t wake up from. Cimino meant to contrast the supposed purity of traditional American values with the war’s hellish suspension of moral categories, and he wasn’t fussy about how he defined his terms—not only idealizing the “clean” sportsmanship of the heroes’ deer-hunting expeditions, but also inventing a Russian-roulette torture by the group’s Vietnamese captors. The Deer Hunter was as overblown as Apocalypse Now, but in a different register, like an opera scored by Springsteen. It had a heavy, plodding spirit, a populist ethos verging (probably without meaning to) on the demagogic, and a defeated air that somehow managed to congratulate us on our wounded innocence, our stunned simplicity. Neither of those big-deal movies was about Vietnam at all—they were about the shape the war took in our imaginations (which is, perhaps, why they were both so muddled and unresolved). 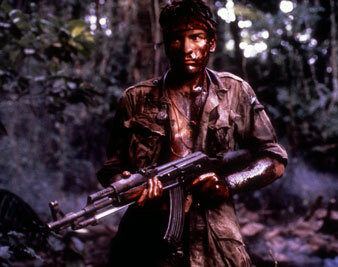 But the war was, of course, more than a bad trip, as Coppola would have it, or a child’s nightmare, as in Cimino. Platoon gives Vietnam back some of its reality. In Platoon, the war is so real that it actually sobers up Oliver Stone, who, as a screenwriter (Midnight Express, Scarface, Eight Million Ways to Die, Year of the Dragon), has developed his own brand of hysterical machismo. The contemporary action pictures he’s written may have started out as explorations of aspects of the underworld and the drug culture, but they all wound up as lurid, wired celebrations of chaos and obscenity: uneasy mixtures of tabloid moralizing and gonzo relish, stuffed into conventional genre structures that served to emphasize the filmmakers’ bad faith. Salvador, released early last year (and now available on videocassette), was written and directed by Stone, and made a little more sense. Its hero, a Hunter Thompson-like freelance journalist played by James Woods (with even more than his usual ferrety intensity), was clearly a kind of war junkie, traveling to Central America in search of a revolution to get high on: the character seemed an acknowledgment of Stone’s own guilty pleasure in out-of-control violence and reckless, “existential” tests of manhood. Although Salvador‘s politics got a bit confused and both the action and the performances were sometimes pointlessly frenetic, the movie managed, in its self-conscious way, to convey the desperate atmosphere of crisis—and without turning its background of Third World turmoil into spectacle (as Roland Joffe’s The Killing Fields often did with its powerful and beautiful images of the Khmer Rouge takeover of Cambodia). Salvador was a wild, unstable movie that, intermittently, was also a vivid essay on varieties of instability, personal and political. Stone’s Vietnam movie is, surprisingly, the cleanest, simplest work he has ever done. He’s not exactly an austere director, even here, but he keeps the movie focused on the day-to-day experience of his platoon through a sequence of five military actions along the Cambodian border, and he has the sense to realize that the young soldiers’ fear is all the subject he needs. Stone treats the war and its participants with a strange kind of reverence, as if here, at the source of his obsession with violence and madness, he doesn’t need to add anything, to jack up the voltage. In some way, the failure of earlier Vietnam movies has probably helped him. We’ve had the war as metaphor for moral chaos, and the war as rock-and-roll hallucination. Stone, who served in Vietnam in the late 1960s, must have looked at those films and asked himself if the war he’d fought was horrible because our leaders were dithering incompetents or because our soldiers were too far gone on pot or acid or Hendrix to know what was happening to them. In Stone’s version, it’s the soldiers who know exactly what they’re doing, who kill most efficiently, like his appalling Sergeant Barnes (played by Tom Berenger, whose facial makeup transcends all previous definitions of “battle-scarred”), that are the most dangerous; and it’s only the “heads”—the guys who smoke pot and listen to rock—who retain some vestige of decency and rationality. He seems to have decided that the war was awful because it was wrong to begin with, and because people were dying all around him. This blunt attitude gives Stone’s writing and direction a kind of ferocious concentration they’ve never had before. The fact that he’s drawing on his own experience obviously helps, too. He’s not scattering wild notions and off-the-wall verbal exchanges all over the landscape, as he usually does: in Platoon, he’s too busy filling in remembered details. He adopts the classic perspective of a young soldier (Charlie Sheen) seeing action for the first time, and everything is seen here with the heightened alertness of terror: the agony of night watches; the lightning-fast mayhem of a fire fight; even the smaller, peripheral dangers—snakes, insects—that help turn simple fear into panic. It’s The Red Badge of Courage, without the courage. “Ain’t no such thing as a coward out here,” one weary veteran tells the young soldier before the climactic engagement: there are isolated acts of genuine heroism, but the only real prize this war has to offer is the sight of the helicopter that lifts you away from it for good. Platoon is even more narrowly focused than World War II movies were—there is (blessedly) little talk among the grunts about the girls they left behind or the candy store they’re going to open up when they get back home or how the Yankees are doing—and the limitation is appropriate and powerful. The platoon Stone has created (or re-created) is a world of its own, where the business of survival drives everything else—even notions of home—from consciousness. Stone’s directorial style, which is fast, kinetic and rather literal, serves him well in the action scenes: there are few battle sequences on film as tense and frightening as these. In the intervals between skirmishes, his writing takes over, and though it’s not as florid as usual, it still causes some problems. The conflict between Sergeant Barnes and his “head” counterpart, the smart, brave Sergeant Elias (Willem Dafoe), is crudely drawn and, worse yet, symbolic: the young hero, narrating in voice-over, refers to Barnes as “our Captain Ahab,” and, after all the shooting is over, speaks of “Barnes and Elias fighting for possession of my soul.” That dramatic hyperbole is meant to illustrate the not very original thesis that Stone saves until the last few seconds of the movie: “The enemy,” Sheen’s voice intones, “was in us.” There is, of course, some truth in that, but there’s some truth in almost anything we can say about that complex war—and what’s refreshing about Platoon up to that point is that it has mostly resisted the impulse to generalize, to make the kind of statement that, like Coppola’s and Cimino’s, can’t possibly tell us any more than a fraction of the truth. At its best, Platoon simply shows us as much as we need to know about a small patch of the territory—Stone’s own experience in Vietnam—which is probably more valuable. It’s a little ironic, though, that after his manic, hallucinated versions of other people’s lives—the feverishly caricatured Turks Chinese-Americans and Miami Cubans of his previous scripts—Oliver Stone has become an honorable and scrupulous artist in dealing with the central experience of his own life. Let’s hope that this strong movie isn’t just an isolated episode in Stone’s career, that he’ll be able to carry over his new rigor and generosity from his memory to his imagination. Vietnam seems to have made him a better filmmaker—his next movies should tell us whether, in the best war-movie tradition, it’s also made a man out of him.